I know I am about a week early for Father’s day post but I just couldn’t stop myself from posting this scrumptious desert li’l bit early as it’s my dad’s birthday on June 9. We stay miles apart so he would not be able to taste it but that couldn’t stop me from baking something special for ‘The Most Special Man’ in my life. My dad has been the strongest pillar for me and my sis. He is my greatest supporter, admirer and best friend. He has scolded me when he must and patted my back even at my smallest of achievements. He has taught me to ride bicycle and has held me before I fell and hurt myself. He has felt my injuries and illness more than I have suffered from them. I have been able to share anything and everything with him. He is the BEST FATHER I could have ever asked for and I thank my lucky stars everyday for it! I will not be there to celebrate this special day along with my family but I would like to send my regards and bestest of wishes along his way. Wishing you a very very very Happy Birthday Dad! May God Almighty bless you with the best of health & may all your wishes come true!!! My dad has been a big fan of summer fruits. As kids I remember my dad bringing bags full of peaches, plums, figs, melons and mangoes uberfresh from Farmer’s Market for us days-after-days. (Actually in case of mangoes, sacks full of it!!!) This is what turned me into biggest fruitaholic! I used to wait on summer holidays for the biggest fruit bonanza to begin so that I could keep hogging on freshest of produce! Be sure to bake this for Father’s Day to make your dad feel extra-special! Its not extravagant but will surely please your dad! Ice-cream, whipped cream or sweetened yogurt for serving (optional), I served mine with vanilla ice-cream and it tasted divine! 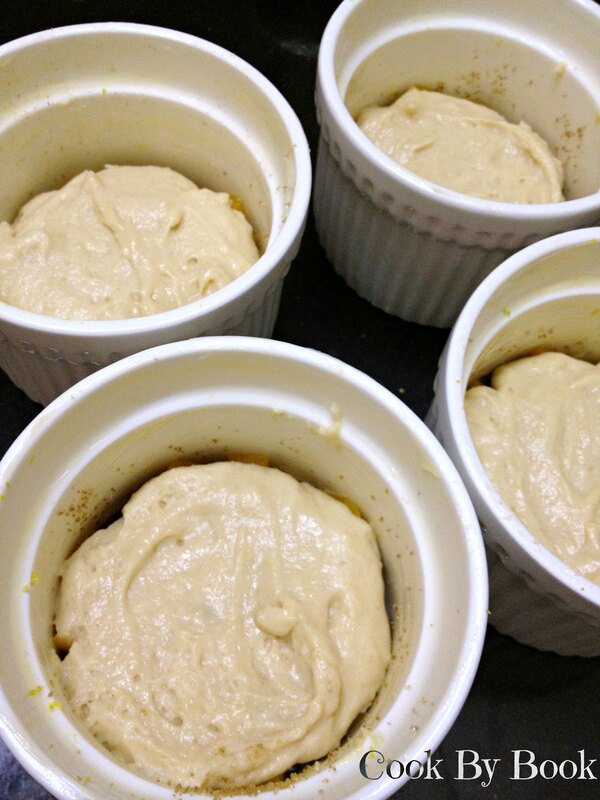 Preheat the oven to 350 F/170 C. Grease each of 4 (8-oz) ramekins with 1/2 Tbsp of butter. In a small cup, melt rest of the butter and keep aside. Sprinkle 1 Tbsp brown sugar evenly at the bottom of each ramekin. 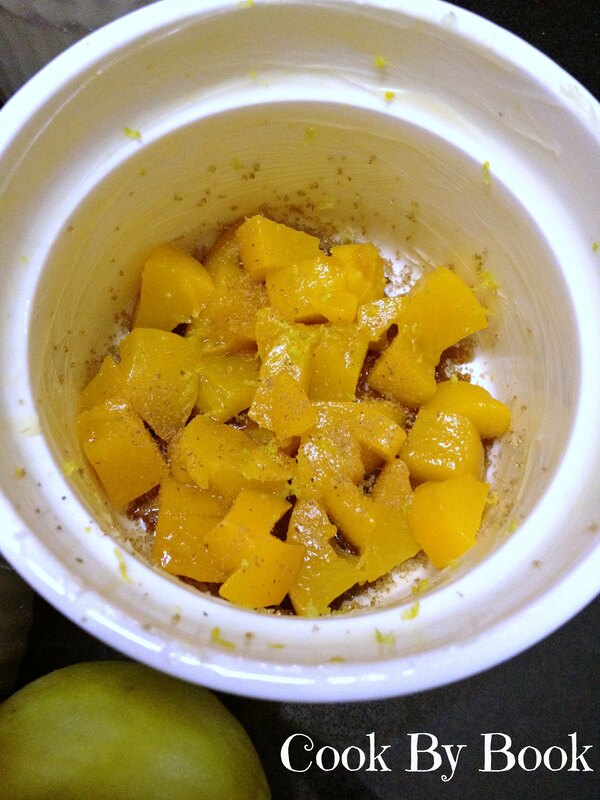 Mix diced peaches with lemon zest and ground cinnamon and divide them equally among 4 ramekins. In a medium bowl, whisk flour, baking powder, baking soda and salt. In a separate bowl, whisk together sugar, yogurt, milk, vanilla and the reserved melted butter. Add wet mixture to dry mixture and stir gently to barely combine. Do not over-mix. Spoon batter over peaches, diving equally. 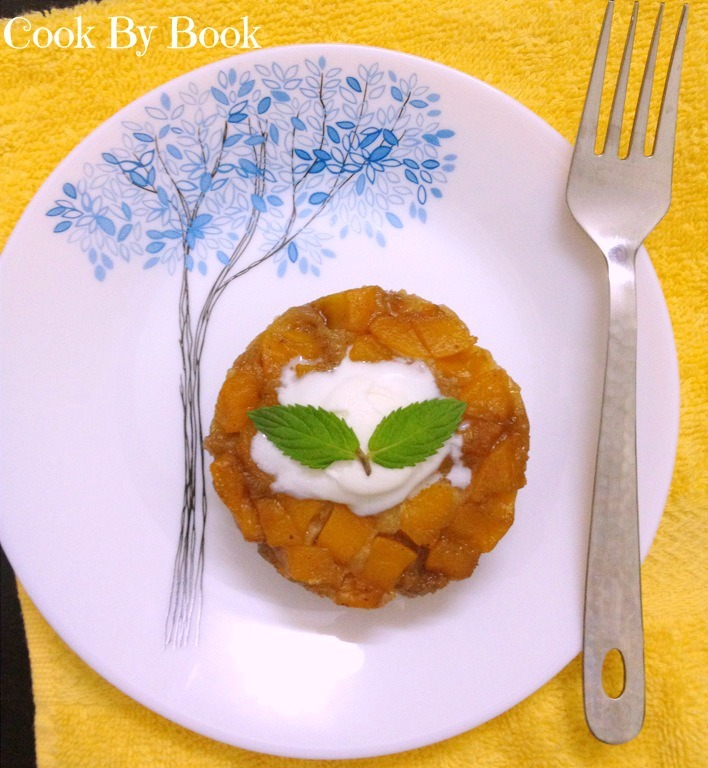 Place ramekins on baking sheet and let it bake for 23-25 minutes or till the toothpick inserted in the center of the cakes comes out clean. Transfer ramekins to cool on wire rack. If serving immediately let cool for 5 minutes and run a knife around the edge of each ramekin and turn upside down onto serving plate. Serve topped with ice-cream, whipped cream or sweetened yogurt, if desired or as is. 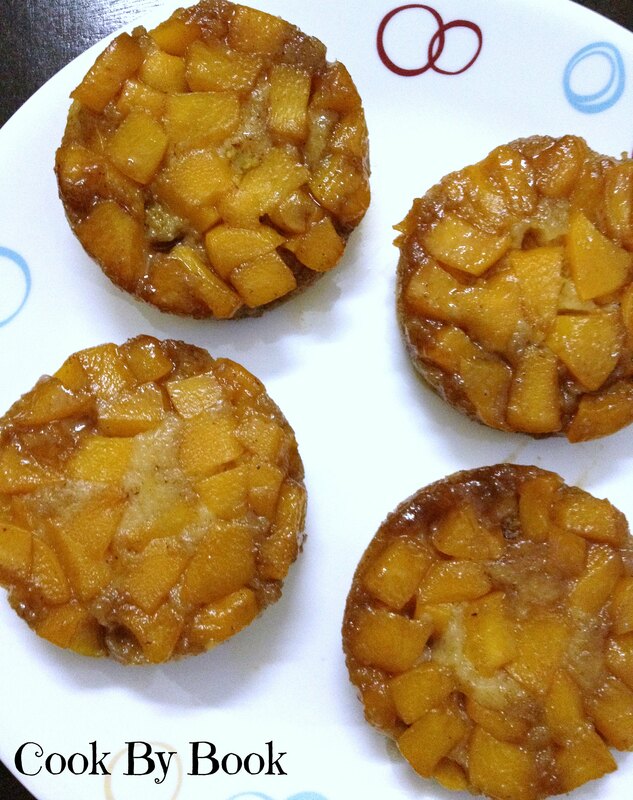 If you are baking ahead of serving time then let the cakes cool for 10 minutes before releasing them from ramekins as the sugar and fruit juices would have thicken a bit by then. Re-hit in the microwave for 20-25 seconds before serving. Preheat the oven to 350 F/170 C. Grease each of 4 (8-oz) ramekins with 1/2 Tbsp of butter. In a small cup, melt rest of the butter and keep aside. 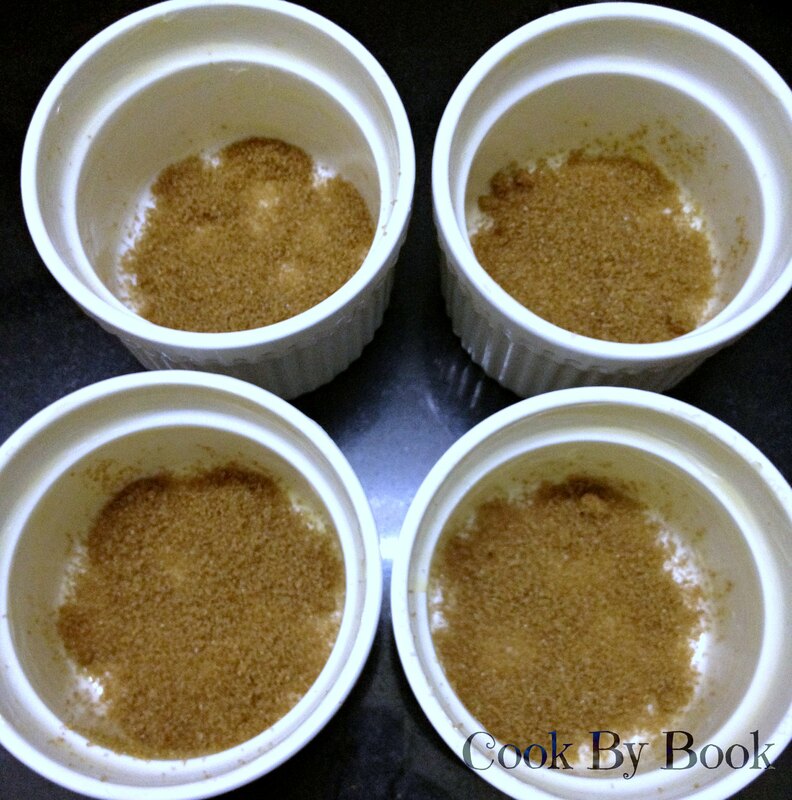 Sprinkle 1 Tbsp brown sugar evenly at the bottom of each ramekin. In a medium bowl, whisk flour, baking powder, baking soda and salt. In a separate bowl, whisk together sugar, yogurt, milk, vanilla and the reserved melted butter. Add wet mixture to dry mixture and stir gently to barely combine. Do not over-mix. Spoon batter over peaches, diving equally. yummy ! shall try out!